Behold, my mighty new folding bike. As I have recently moved to South East England and restarted to work in London, I decided to finally do something for my ever expanding waistline and save some serious money. A win-win situation? You bet! So, how was I able to accomplish this amazing feat? 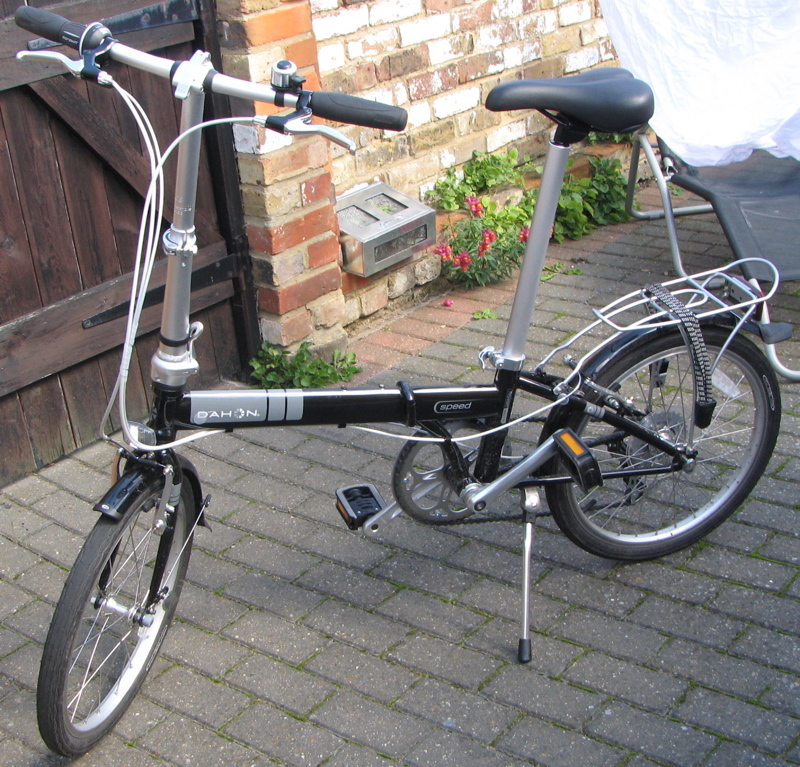 I bought a Dahon Speed D7 folding bike. Before making the acquisition, I checked out the numerous cycling forums (of which there are literally thousands), compared prices (from 100 pounds to 2000 pounds) and models (and if you think that nerds could be easily drawn into fisticuffs discussing Windows, OpenBSD and Linux then you should see the level of passion that users of Bromptons, Dahons and Birdies can get themselves into). Have a look at the folding society’s homepage, and you know what I mean. With other words, it’s not easy being a first time folding bike buyer. According to the manufacturer it’s the most popular folding bike in the world according to their sales numbers, and who am I to doubt them. So, how is the ride? Well, it’s exhilarating. I haven’t had as much fun going to work since living next to a penguin colony in New Zealand. Due to its tiny wheels (tire size is a meagre 20″ x 1.5″) its very, very easy to manoeuvre, thanks to its seven gears it hums along at a decent speed. With me having to cycle to the train and cycle from the destination station to work, I manage a daily round trip of 13 km. According to my calculations this will set me back 2000 calories a week, which should result in a weightloss of 1 kg in a month. That’s not bad at all, and it’s incredible fun. And, because I don’t have to take the tube for the last 5 km, I save a cool 6 pounds every day, meaning the bike has already paid for itself after 2 1/2 months. So, thumbs up for the Dahon Speed D7. If enough of us would ride these babies, London would be a more pleasant, cleaner and healthier place. Now there’s a quotable quote. A great picture of an awesome bike. 1. Did you ever actually see a penguin. I waited half a day, and only saw some silly tourists behaving badly. 2. What do you know about the Dahon Speed TR. I haven’t seen one in NZ, but it looks the ticket for touring and carrying on aircraft.